It’s our second installment of New Listing Mondays! Every week, we post an update on the newest and hottest properties in 90210 and 90402. This week is an especially busy one! Participate: See a hot new listing in Los Angeles? Play along by posting on Twitter or Facebook using the hashtag #NewListingMonday. For more information or to set up a showing, just call or email Connie! 1845 Franklin Cyn Dr, listed at $1,350,000. Nestled in peaceful Franklin Canyon, a fixer-upper with exposed beams and opportunity to create a dream home. Hike the mountains while still being close to the heart of Beverly Hills. 2,100 sq. ft. on a mostly flat 7,200 sq. ft. lot. 1591 Clear View Dr, listed at $4,195,000. Custom-built home on 3 lots with panoramic views of Santa Monica Mountains. 1400 sq ft wraparound deck, nearly 1/2 acre of landscaped, wooded mountainside, terraced waterfall, detached artist’s/writer’s retreat, and outdoor kitchen. 4,000 sq. ft. on a 20,000+ sq. ft. lot. 1625 Clear View Dr, listed at $1,295,000. Remodeled contemporary in quiet neighborhood with views. Wooden floors, rooftop patio, stone/glass fireplace, large water fountain, windows all around with views of canyons. Basement not included in square footage. 1,800 sq. ft. on a 10,000+ sq. ft. lot. 3307 Clarendon Rd, listed at $10,995,000. Tuscan Villa in guard-gated Mulholland Estates. Incredibly spacious. Decorated with a nod to the opulence of Versailles, yet with the right touch of modern design. Entertainer’s dream come true, with several dining/living areas, a night club space, screening room, recording studio, pool, spa, and half-pipe skating ramp. 11,000 sq. ft. on near 20,000 sq. ft. lot. 1380 Davies Dr, listed at $4,995,000. Gated contemporary with city and canyon views and oversized windows with lots of sunlight. The staging is reminiscent of 1980’s hairspray advertisements, but with a little love and any awareness of style whatsoever, this gem could be anything from a hip modern entertainment space to a breezy, spacious home where comfy white couches set the scene. 4,700 sq. ft. on a 5,300 sq. ft. lot. 9135 Hazen Dr, listed at $12,495,000. Red-brick Georgian Colonial on over an acre of lushly landscaped grounds with luxurious yet comfortable living space. Formal two story entry with a dome skylight originally from a bank in Brooklyn. Wood-paneled office/library, lower entertainment level, and dry sauna in addition to pool and wet spa. 10,000 sq. ft. on 46,000 sq. ft. lot. 10059 Westwanda Dr, listed at $699,000. Cozy, charming contemporary bungalow in quiet neighborhood with huge glass panoramic windows, incredible upstairs deck, and spacious lot. Off street parking, plenty of storage, 1 car garage, laundry room, and several entertainment areas. 680 sq. ft. on 5,000 sq. ft. lot. 13319 Mulholland Dr, listed at $9,995,000. Spectacular gated Mediterranean estate. Sophisticated design, open floor plan, high ceilings, romantic fountains, and walls of glass throughout. Enormous roof deck accessible via several spiral staircases, giving 360 degree city views. 8,000 sq. ft. on 30,000 sq. ft. lot. 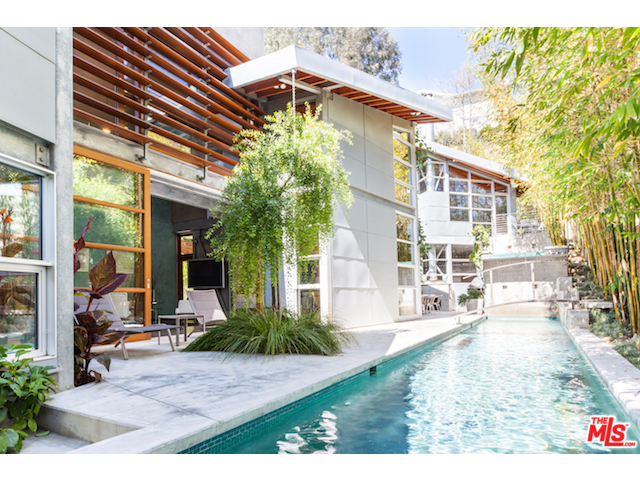 2100 N. Beverly Dr, listed at $4,950,000. Reminiscent of a Great East Coast Traditional with great architectural integrity. Remodeled and upgraded in exquisite taste. Park-like grounds on private road. Exposed beams, beautiful hardwood floors, chef’s kitchen, detached two-room guesthouse. Outdoor area includes landscaped gardens, babbling brook, fireplace, and pool. 34,000 sq. ft. lot. 9540 Oak Pass Rd, listed at $14,995,000. Stunningly renovated East Coast inspired Hamptons Traditional Masterpiece with detached guesthouse. Incredible warmth & charm with Ralph Lauren inspired interiors. Large outdoor pavilion with kitchen, BBQ, pool & spa. Terrace overlooking enchanting vistas. 8,800 sq. ft. on 80,000 sq. ft. lot. 9501 Gloaming Dr, listed at $23,950,00. Monterey Colonial with long, gated private drive with exceptional views of the city below on coveted 10-acre lot. Restored Estate feat. two additional large guest houses and additional staff quarters. Rolling lawns and vistas, zoned as equestrian estate. 6,400 sq. ft. on 453,000 sq. ft. lot. 2121 La Mesa Dr, listed at $19,950,000. Meticulously renovated Contemporary with breathtaking views of Riviera Golf Course. Two separate upper wings, open floor plan, enormous skylights, viewing theater for twenty, climate controlled wine storage for over 800 bottles. Upper west & east wing feature two large guest suites each, some with private kitchenettes. Outdoor space with pool, spa, seating area, fire pit. 9,300 sq. ft. on 23,000 sq. ft. lot. 201 14th St, listed at $4,995,000. Buyer/user or investment opportunity in North of Montana, off of San Vicente, centrally located & close to desirable shops, restaurants, and beach. Biggest corner lot in area, Cecil Gale designed home built 1955. Spacious backyard that backs up to a private alley with plenty of room to expand (dimensions perfect for a pool & outdoor entertainment area). 3,100 sq. ft. on 11,000 sq. ft. lot. 1140 San Vicente Blvd, listed at $5,495,000. Beautiful, newly built Santa Barbara Mission home with exposed wood beams, custom fireplace, distressed engineered hard wood flooring, hand-painted imported tiles, recessed ceiling speakers, chef’s kitchen, custom hand carved wood bath cabinetry and Jacuzzi tub, and salt water pool – solar heating. 5,300 sq. ft. on 9,600 sq. ft. lot. 333 22nd St, listed at $5,500,000. Drop-dead gorgeous Santa Monica villa located in one of the prime sections of Santa Monica North of Montana Avenue close to restaurants and shopping. Remodeled from top to bottom. High ceilings, recessed lights, hardwood floors, skylights. 5,500 sq. ft. on 7,500 sq. ft. lot. 502 18th St, listed at $3,695,000. Beautiful Gillette Regent Square English Country home. Extensively and tastefully remodeled. Custom millwork throughout, wide planked oak floors, gourmet kitchen, coved high ceilings, casement windows. Private entertainer’s courtyard with outdoor dining area, fireplace, and “Endless” pool. 8,900 sq. ft. lot. 700 Kingman Ave, listed at $6,995,000. Cutting edge, dramatic architectural in the Santa Monica Canyon. Seamless indoor outdoor flow to gardens and pool while flooded in light and breezes from the Pacific Ocean. Steel beams, ten foot floating glass doors framed in mahogany plus venetian plaster walls. Glass bottom bridge. Designed collaboratively by architect and owner and built with unusual attention to all details. 4,200 sq. ft. on 7,500 sq. ft. lot.